The Vortex Razor HD 22-48x65 straight spotting scope is the premier spotting scope offered by Vortex. 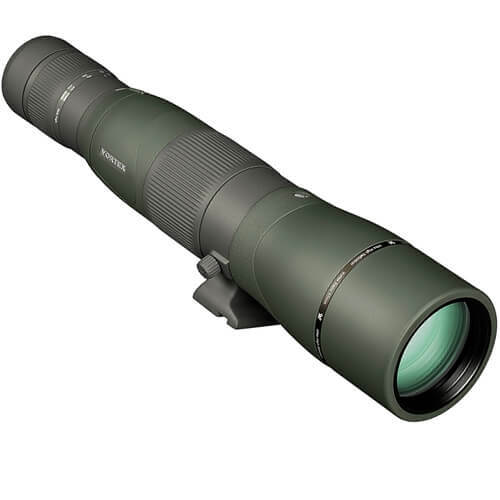 It features high density glass for the clearest possible images, XR plus multi-coated lenses for optimal light transmission, Armortek for scratch, oil and dirt resistance, focus ring that surrounds the outer body of the scope, rubber armored body for extreme durability, and a built in sun shade that pulls out to reduce glare. As with all Vortex products this scope is covered by the VIP warrantee which extends for the life of the product and is transferable.